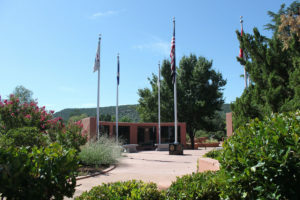 On Memorial Day 2015 a 2nd Annual gathering took place at the Sedona Military Service Park in Sedona, Arizona. Presented by the Sedona Marine Corps League Detachment #1237, this moment to honor fallen soldiers was hosted by Col. Judith Patton. Entertainment was provided by Tom and Shondra. Mayor Sandy Moriarty gave a presentation, along with Marine Pam Del Porto. City Manager Justin Clifton and Reverend Grace Rowe also participated in the events. Jolene Pierson of the Veteran’s History Project was thanked for her Veteran’s History Project. This event was video taped and edited by Terrie Frankel, USO Vietnam 1968 and member of the Sedona Marine Corps League and Honorary Commander of the 944th Aeromedical Staging Squadron.